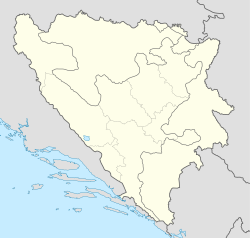 Velika Kladuša (pronounced [vɛ̂likaː klǎduʃa]) is a ceety an municipality in the far northwast o Bosnie an Herzegovinae, locatit near the mairch wi Croatie. The closest ceety is Cazin, an a bit farther, the ceeties o Bihać an Bosanski Novi. Athort the border, it is no far frae Cetingrad. Admeenistratively, it is pairt o the Una-Sana Canton o the Federation o Bosnie an Herzegovinae. The Velika Kladuša municipality haes mony smawer touns an veelages inside it sic as Mala Kladuša, Todorovo, Podzvizd an Crvarevac an aw. The toun o Velika Kladuša is the centre for the municipality acause maist hospitals, stores an govrenment biggins are locatit thare. Velika Kladuša wis first mentioned bi name on 30 October 1280 (date on its shield) bi the name Cladosa. Durin the era o Byzantine Empire it is assumit that the population o the toun stairtit tae slowly grow. Towards the end o the 13t century up tae 1464, Velika Kladuša wis controlled bi twa different Croatie keengs. Aroond 1464 the Ottoman Empire wis expandin towards this region an the toun wis feenally captured in 1633. Velika Kladuša wad later acome the centre o Ottoman expansion intae neebourin Croatie as well as the rest o Europe. At the stairt o the occupation o Bosnie an Herzegovinae bi the Austro-Hungarian Empire in 1878, Velika Kladuša alang wi ithers in the region, put up the biggest resistance in the region. Nivertheless, it developit wi the openin o schuils, the introduction o laund register beuks, an a mosque an a catholic kirk wur biggit. Durin WWII the region o Velika Kladuša focht on the side o the Yugoslav Partisans. At ane pynt the toun switched alliances an alloued the Nazi’s tae occupee it but this wis planned oot wi the Partisans acause thay then surprised the Nazi’s bi jointly attackin them wi the Partisans. The fowk in this region wur aaways strang supporters o Yugoslav Preses Josip Broz Tito an communism. Ane café in Velika Kladuša wis namit “Tito” in his honour. In era o Yugoslav socialism the toun became the heidquairters o Agrokomerc, ane o biggest fuid companies in Socialist Federal Republic o Yugoslavie. The company stairtit as a single fuid producin farm an grew tae an estimatit 13,000 employees at its peak o production. Agrokomerc made Velika Kladuša an the surroondin regions turn frae ane o the poorest in Yugoslavie tae ane o the richest. Velika Kladuša wis at ane pynt cried “The Swisserland o Yugoslavie” due tae its smaw size but great walth an at ither pynts it wis cried "The Cayman Islands o the Balkans". Durin the war in Yugoslavie, Agrokomerc still continued tae operate as it producit aw types o fuid boond for Zagreb, Belgrade an ither places. Agrokomerc wirkit wi internaitional companies as far awa as Ecuador, Colombie, Germany an Brazil. The day Agrokomerc still wirks but at a smawer capacity than afore the war. It is aften chyngin directors an is currently athoot ane. Durin the Bosnie War (1992–1995), the toun wis the caipital o the sel-declared Autonomous Province o Wastren Bosnie. The seat o the govrenment wis at the Stari Grad Castle which haed defence forces guardin it throughoot the day an nicht. The ceety itsel did no suffer hintle damage as it wis maistly spared o lairge fechtin. Follaein the end o the Bosnie War, the toun wis the hame o the Czech helicopter unit an Canadian Forces NATO camp supportin the IFOR an SFOR peacemakkin missions frae 1995 tae 2003. The day the fowk are maistly Bosniaks but thare are still some Serbs who hae mainly come frae Serbie Krajina an ithers includin Gypsies, Yugoslavs an Albanies an aw. Wikimedia Commons haes media relatit tae Velika Kladuša.